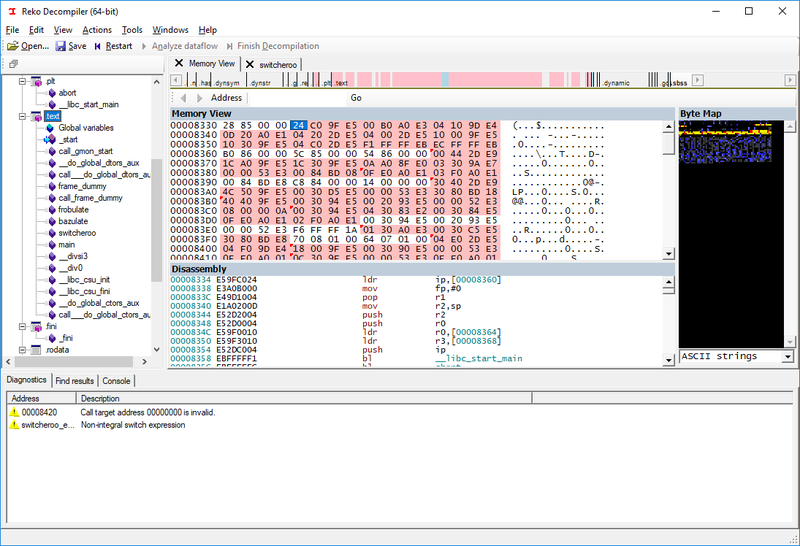 Reko (Swedish: "decent, obliging") is a C# project containing a decompiler for machine code binaries. This project is freely available under the GNU General Public License. Official releases are published every few months on Github and SourceForge. Users who can't or won't build Reko themselves can download the output of the AppVeyor integration builder. Naturally you can build the project from the sources: see "Hacking" below. Note: we've been unable to test Reko with the most recent version of mono, 5.16.0, because a bug in said version makes it impossible to build. This has been reported in mono/mono#11663. After installing mono, you can proceed by either downloading binaries directly from the integration build server, or by building Reko from sources (see Hacking below). To get acquainted with Reko's various features, you can read the user's guide. If you're interested in the internal workings of the project, see the wiki. You can report any issues you encounter or ask any Reko-related question on the issue tracker. You can also try the Reko Gitter.im chatroom. Reko is built by volunteers' efforts on their spare time, so adjust your response-time expectations accordingly. (provided you have msbuild installed). All external dependencies needed to build Reko are included in the external directory. Note: please let us know if you still are not able to compile, so we can help you fix the issue. If you're interested in contributing code, see the road map for areas to explore. The Wiki has more information about the Reko project's internal workings. Please consult the style guide. How do I start Reko? The solution folder Drivers contains the executables that act as user interfaces: the directory WindowsDecompiler contains the GUI client for Windows users; MonoDecompiler contains the GUI client for Mono users; CmdLine is a command line driver.